Whether you’re managing an office building, selling things in a retail store, or provide some kind of service in a brick and mortar building, your front windows are what tell people driving or walking by about what they can expect to find inside your doors. Don’t let these windows go to waste. Use the space to promote your special services or highlight particular products. Maybe you can just give your current patrons some privacy, or you can inform prospects about what they can get from your business. 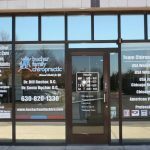 In all these cases, high-caliber vinyl graphics and window signs are here to help you accomplish your goals. 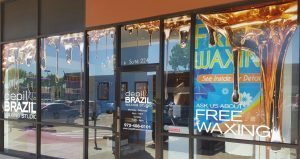 Genesis Signs & Graphics is is a local vinyl window graphics provider, standing by to make beautiful and attention-grabbing window displays, graphics, and clings which give your business and brand the emphasis they deserve. Call Genesis Signs & Graphics today at (347) 709-7446 for your Free Consultation with Window Signs Specialist! 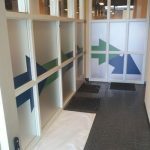 Genesis Signs & Graphics makes the window graphics and signs that are perfectly suited to your business needs. We have an on-site graphic design staff that can help you make customized window graphics which help you reach your goals. Get your marketing message out to the community with products that stay aligned with your branding guidelines. Are you unsure which particular vinyl product best suits your distinct needs? Don’t worry about it! You can enjoy a free consultation with one of our windows signage specialists at no charge or obligation. They’ll recommend what vinyl solution best suits your physical location, existing business needs, and budget limitations. Retail stores emphasize their window displays quite a bit, and there’s great thinking behind that. Window displays that are attention-grabbing and attractive might get people passing by to enter the business. 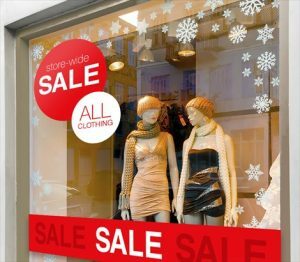 When you have a sale, promotion, or product you want to highlight, a window display is a great way to accomplish this. A conventional and effective use of a window display is to seasonally display your latest and greatest offerings. We’re here to offer you eye-catching window banners, graphics, and signs that help you promote your business, even if it’s just at an event, sale, or product level. These professional displays can bring more customers in your door in the short-term while building up your long-term reputation. You don’t have to use your windows to sell anything though. It’s not appropriate for all businesses, as some might enjoy privacy film and the seclusion it provides. This works well for office buildings that house law firms and therapists whose clients might prefer a certain level of discretion. 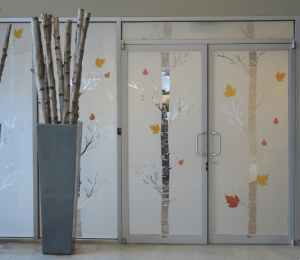 We can make you privacy film in either a frosted glass finish or even an etched look, and our privacy film is certainly cheaper and less permanent than panes or panels of frosted glass you might have looked at previously. If you do want to involve some branding purposes into your privacy film, we can include the name of your business, a logo, or other imagery that you choose, all without compromising the effectiveness of the privacy. 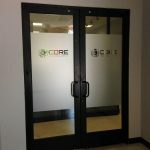 We’ve got plenty of examples of popular vinyl film selections we’ve done in the past, but we can also create a custom privacy film for you, so you’re sure to find what works right for your company. You don’t have to sell retail merchandise to use window displays that make a positive impact for your business. Dress up the windows you have with graphics that highlight the services you find most profitable, special deals you’re running, or even a mural depicting what your business does best for your potential customers.. We have experienced designers that work with you to make the display that your business needs before our full-service signage shop makes the physical product and in some cases installs it for you! 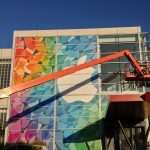 We’re waiting to work with you from consultation and design to creation and installation, so that we become your one and only window signage provider. Regardless of what kind of business you run or what specific goals you have, Genesis Signs & Graphics has the ideal products to put in your business windows.